Look no further for an easy brunchtime stuffing and egg bake recipe. 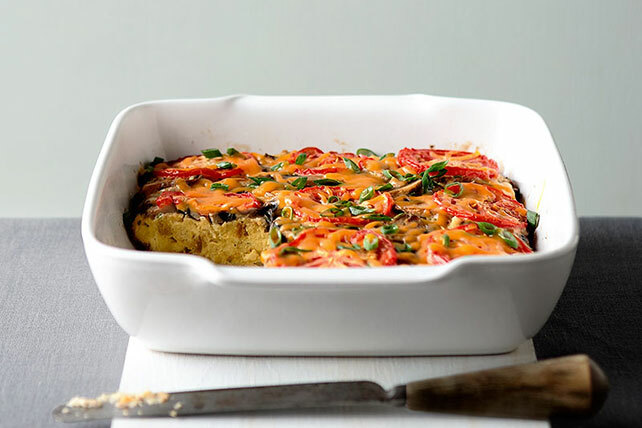 With tomatoes, mushrooms and more, our Easy Stuffing-Egg Bake recipe is delicious! Heat oil in medium skillet on medium-high heat. Add mushrooms; cook 4 min. or until tender, stirring occasionally. Beat eggs, milk and mayo in large bowl with whisk until blended. Stir in stuffing mix. Spoon into 9-inch square baking dish sprayed with cooking spray; top with mushrooms, tomatoes and onions. Bake 35 min. Sprinkle with cheese; bake 15 min. or until center is set and cheese is melted. Let stand 10 min. before serving. Save 60 calories and 8g fat, including 2.5g sat fat, per serving by preparing with KRAFT Light Mayo Reduced Fat Mayonnaise and KRAFT 2% Milk Shredded Cheddar Cheese, and substituting 1-1/2 cups cholesterol-free egg product for the 6 eggs. Cover unbaked casserole tightly with plastic wrap; freeze until solid. Cover with foil. Freeze up to 3 months. When ready to serve, heat oven to 350ºF. Remove foil and plastic wrap. Discard plastic wrap. Re-cover casserole with foil. Bake 1 hour. Remove foil; sprinkle casserole with cheese. Bake, uncovered, 15 min. or until center is set and cheese is melted. Let stand 10 min. before serving. To decrease the baking time, thaw casserole in refrigerator overnight, then bake, uncovered, 40 min. or until center is set and cheese is melted. Sprinkle egg mixture with cooked and crumbled OSCAR MAYER Bacon along with the mushrooms, tomatoes and onions.